The Gluten-Free Edge Has Moved! The Gluten Free Edge (without a hyphen). Please join us there! Rita has reset the address pointer and it should be OK.
you will need to grab the new one and delete the old one. except for a new recipe post for Clara’s Brown Sugar Pound Cake. Several months ago when Ricki requested volunteers to test recipes for her breakfast ebook we jumped at the chance. Rita and I have been fans of Ricki’s nutrition philosophy and her delicious, nutritious recipes for quite a while. Even now, there is a double batch of her Warm Chickpea and Artichoke Salad (we live in Texas where I serve it chilled with greens) in the refrigerator right now waiting to go to a potluck later today. The last time I brought this to a potluck I had to scrape the bowl to get a tiny amount to add to my lunch the next day! –one of only three cookbooks recommended on Ellen DeGeneres’ website! 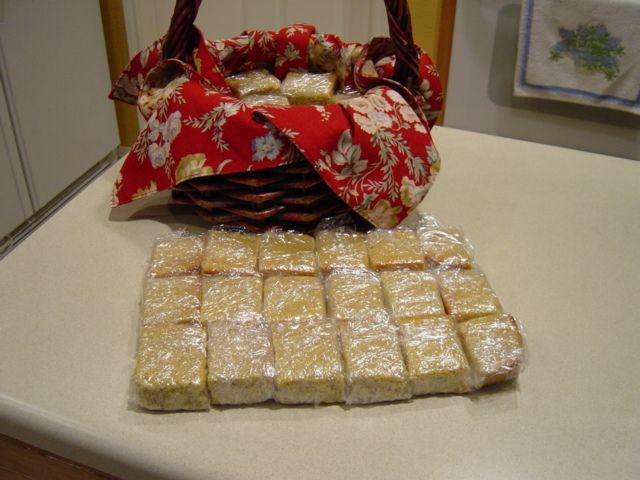 For a full Table of Contents and photos of many of the recipes, see this post. The recipes are all great for anyone following an anti-Candida diet (ACD); for vegans; those on a gluten free, refined sugar free, egg free or kosher diet; or Type II diabetics. PS – The Gluten Free Edge is moving to our own domain as soon as we sort out some of the technical tangles. Ever since Lori asked if I could put together a class on the topic of ‘gluten-free’ for The Caring Place I have been reading and reviewing books from our local Georgetown Public Library because I believe in quality reference material. At about the same time Barb had sent me a link to a book review and the next thing I knew I was head-over-heels in reading materials both borrowed and purchased. Libraries have always seemed like magical places to me. All of those books on so many subjects: if I could read them all then I would certainly know everything. At least that is how I viewed the school library at Meadowbrook Middle School when I first became aware of library passes and the resulting unlimited access to all those books! OK, so now I know better but still there is so much knowledge that can be gained just by going to the library. So I have borrowed books, read books, reviewed books for the local library and on Amazon, purchased books, and donated books. If the class learns nothing from me at least there will be a rich and varied resource to fall back on. The assembled collection (below) covers so many related aspects of gluten that I was having trouble narrowing down the information to present. Simple, keep it simple – you can see from the list of books that I have real problems with that. So I decided on this approach. 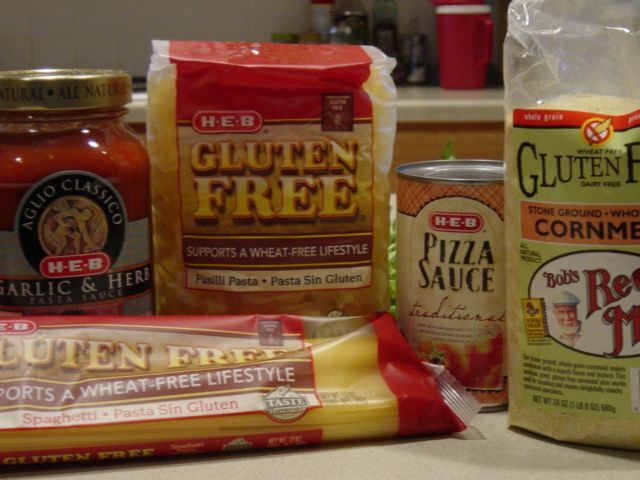 On the first day we meet there will be samples of home-cooked pasta and sauce using store brand GF ingredients from HEB and a sample of commercial snack food (Glutino pretzels). We will introduce ourselves and then together we will plan the next meeting around the most pressing needs of the group. And we will continue from there. Rita has been reviewing some of the books with me. Since she is also a Certified Health Coach I hope to have her lead a ‘gluten-free’ tour of a Georgetown grocery store. Back in December 2010, shortly before Christmas, Rita and I attended a book signing at Book People in Austin. Chef Alain Braux was signing his book Living Gluten and Dairy-Free with French Gourmet Food and serving samples of his legendary Flourless Chocolate Cake. 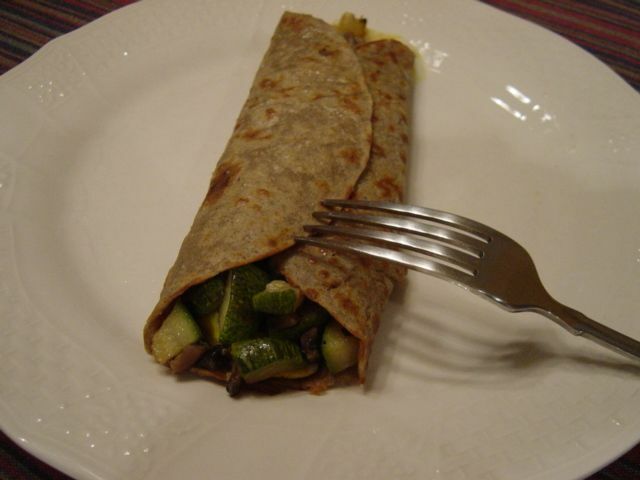 At that time Alain gave us permission to publish his recipe for Brittany-Style Savory Crêpes. Since then I have cooked up many, many of those crêpes. The batter holds up very well in the refrigerator so I can have crêpes for several mornings before all of the batter is gone. Initially the filling centered on variations of ham, egg, and cheese but as we move into spring my thoughts turn to lighter versions. This concoction of smothered sweet onions, mushrooms, and calabacitas* in coconut milk sauce passed the taste test with our neighbors Barb and Dona. *Note: Calabacitas is Spanish for ‘little squash’. It looks like a first cousin to zucchini being shaped slightly different and having a lighter, mottled green color. The seeds are finer and disappear almost entirely when cooked. The recipe for the crêpe can be found -> HERE. BTW, I cook these crêpes using coconut oil because 1) it has exceptional browning qualities and 2) coconut oil is very healing to the digestive system. Sauté each of the vegetables separately in coconut oil until lightly browned and season each batch with salt, pepper, and garlic powder. Set aside the mushrooms and squash as they finish. 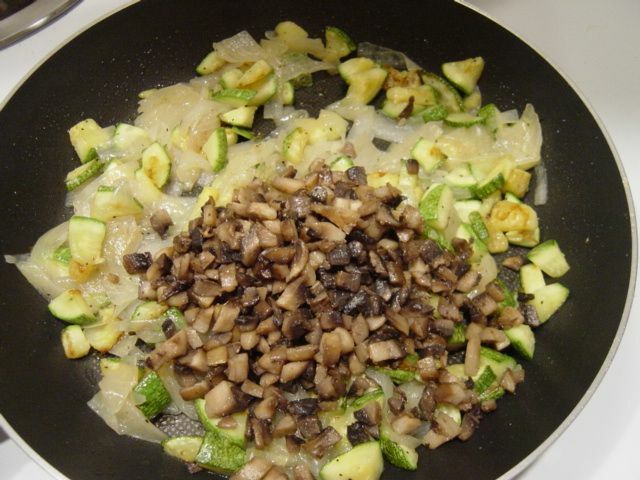 When the onions have caramelized add the mushrooms and squash back into the skillet with the onions. Add the coconut milk, cover with a lid, and place over low heat to ‘smother’ until you are ready to fill and serve the crêpes. Extra filling may be stored in the refrigerator as well as extra batter. I had one of these crêpes for dinner. I took a picture of it for the blog, and then I inadvertently deleted it before saving it to the hard drive . . . . Maybe because I was daydreaming about how it would be possible to add ‘smell-a-vision’ to the picture. It was that good! Update 2011-03-21: Another Savory Crêpe – yummy as well as beautiful! 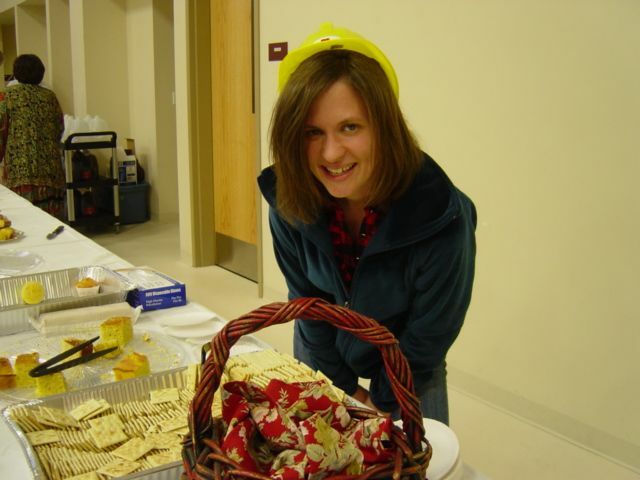 March 15 was the day of the 2011 Soup Supper annual fund raiser for The Caring Place. Every year the best restaurants in Georgetown contribute gallons of their specialty soups and TCP volunteers donate cornbread and desserts. Aside from baking we also put on aprons and serve our guests who come to enjoy the meal. There is also a silent auction featuring some of the very nicest things from the in-house Fabulous Finds resale store. Clothing from the boutique is modeled to show off the incredible quality that can be found in that department. Once again I baked gluten-free cornbread. 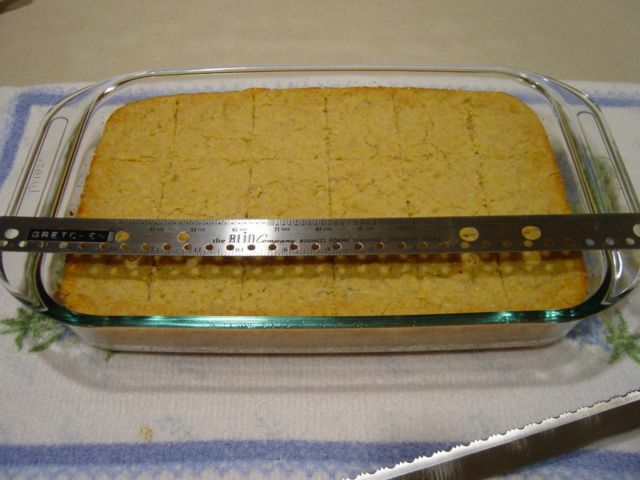 Last year I made one batch of scratch cornbread and one batch from a mix. The scratch gluten-free version was no doubt the favorite. So this year I baked two double batches of scratch cornbread. I made a test batch a few weeks ago just to be sure I would not mess up a lot of expensive ingredients and I am glad that I did. I found that the cornmeal remaining from last year, carefully stored in the freezer, had developed an ‘off’ taste. So every year that I make this I will be sure to buy a fresh bag of Bob’s Red Mill Gluten Free Cornmeal. Astigmatism makes cutting straight lines a challenge so I got out my ancient, trusty forms ruler from data processing days. Yes, the little sticker has my name on it. Back-in-the-day Don and I had his-and-her forms rulers; definitely a geeky household here. It is wonderful how many people turn out to support this organization. By the time I gathered my few remaining wits together we were winding down, most of the cornbread was gone, but I did manage to snap a photo of Amanda. She was charming and cheerful throughout the evening and the time passed very quickly. We were wearing the yellow construction ‘hard’ hats to call attention to the fact that work has already started on the new food pantry facility at The Caring Place. Donation boxes on the tables were another subtle reminder. Those of us who work in the pantry are delighted that this construction has begun. We are also anticipating a better warehouse area for managing the storage of food and more efficient stocking of the pantry. HEB is a Texas-based company with headquarters in San Antonio. This organization is very generous in support of The Caring Place (TCP) in Georgetown with their daily donations of bread and support of other TCP programs. They have also been long term suppliers of my most basic gluten-free grocery needs. I needed to replenish my Bob’s Red Mill gluten-free cornmeal in order to make several pans of GF cornbread to be served at the Annual Soup Supper to benefit TCP (where Don and I both volunteer). Our nearby HEB on Williams Drive carries a good selection of these products. While I was shopping there I decided to check out their brand of pasta that Clara had tried and told me about. I was really curious because Don and I had been on the HEB product taste-testing panel quite some time ago. Also, as a volunteer in The Caring Place food pantry I often hear comments from people trying to manage gluten-free about how expensive it is. This is what I found. I also picked up Udi’s Whole Grain Sandwich Bread while I was there since there were only three slices remaining at home from the previous loaf. Price wise this one is in my ‘luxury item’ category. But it is handy to keep in the freezer for when I don’t have time to put together something else for the carb portion of a meal or snack. Pizza celebrations have been going on for almost two weeks now. ATX Austin Gluten-Free Pizza Fest is sponsored by Jessica Meyer. She keeps us informed about all of the gluten-free options in this part of Texas. I missed the first part while out of town but Don and I finally had our home grown pizza fest. During the last year I have tried numerous recipes trying to come up with the optimum nutritious pizza recipe for gluten-free and otherwise allergic and digestive challenged family and friends. We had a crust that Don liked but it did not meet the allergy friendly criteria. In the interim he has gone back to making his own glutinous crust while I experiment with the gluten-free versions. For the sake of consistency Don then adds identical toppings to both pizza crusts. I think I finally have the amounts of flours and binders along with seasoning, oil, and leavening. 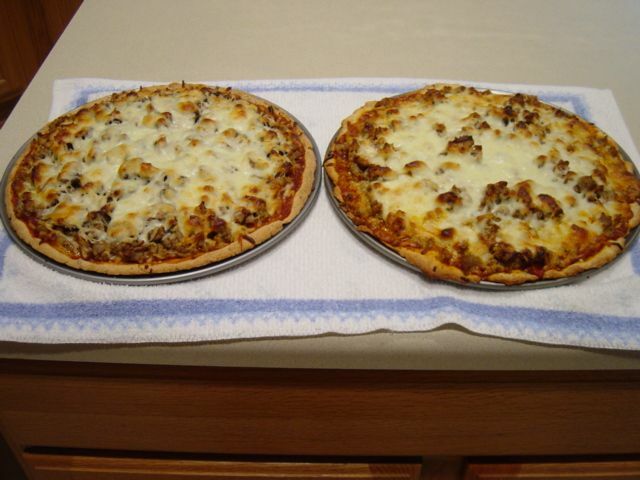 It makes up into dough that handles well and is sturdy enough to support the toppings. But I am still tweaking the taste component of the flour blend. This time the texture was excellent but the coconut flour made it too sweet. So I am posting the amounts until such time as we together bake pizza and Don declares it a winner. Oil a 12” pizza pan and set it aside. Set the oven for 425*F.
Measure the dry ingredients into a medium mixing bowl. The seasonings are optional but some of the denser, high nutrition flours have stronger flavors that need a little help to bring the crust over to the Italian side. Add a cup of the water and then the oil to the flour mixture. Stir well for at least a minute to see how much of the flour does not blend into the dough. Add the remaining water a little at a time until all of the flour is incorporated and you have a lump of dough that is resilient and very hard to stir. Dump it out on your work space and knead it until all traces of flour blend in. Form it into a flattened ball and move it to your prepared pizza pan. Continue to flatten the dough while rotating the pan. The two cups of flour makes enough dough that it should generously cover the bottom of the pan and have plenty to build up a nice edge to hold your sauce and toppings. Slide the pan into the oven for a 6-7 minute pre-bake. At this point I turn the gluten-free pizza crust over to Don and he adds toppings to both pizzas, puts them in the oven to bake, and calls me when dinner is ready.